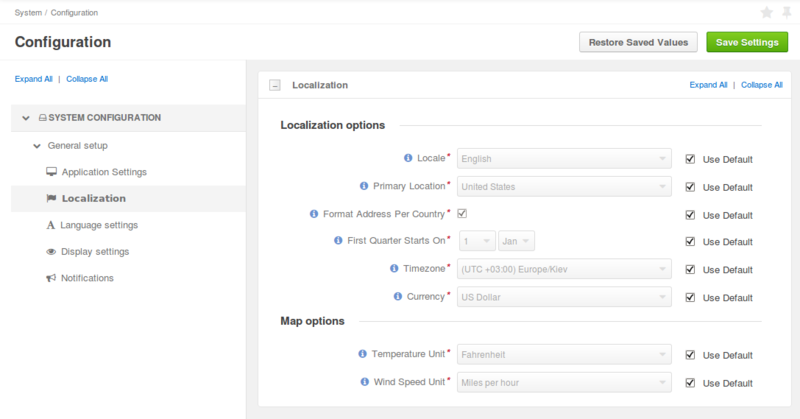 Localization is the process of translating and adapting a product for a specific country or region. OroPlatform allows a user to customize the format of date/time/datetime, numeric and percent values, monetary values as well as the format of names and addresses. The Temperature Unit and Wind Speed Unit are used to render additional information on location maps. This file contains the most basic information for countries (US and RU are country codes as defined by ISO 3166). Each country configuration provides information about a country’s currency (according to ISO 4217), the phone number prefix (as defined in E.164) and its default locale (e.g. the locale that is used to define the appropriate name format by country for specific address). This file defines currency symbols for each currency code. These symbols are used to render currency symbols when viewing or editing monetary fields. en: "%prefix% %first_name% %middle_name% %last_name% %suffix%"
format: "%name%\n%organization%\n%street%\n%CITY% %REGION_CODE% %COUNTRY_ISO2% %postal_code%"
This file specifies the name format for addresses and, optionally, some additional address information. Each placeholder can be lowercased (data will be rendered as is) or uppercased (data will be rendered in upper case). Both dates and numbers (decimal, percent or currency) are formatted using INTL library functions. Therefore, this library is required and dates and numbers are formatted according to the installed version of the library. Some entities in the application may have names that require localization before they’re rendered. Localization includes the formatting of name parts according to a specified format (see name_format.yml). On the backend side, such an entity must implement the name interface. This interface contains methods to extract all parts of a name, including the name prefix, the first name, the middle name, the last name and the name suffix. Furthermore, there are separate interfaces for each name part that can be used when an entity defines only a subset of the full name definition. Formatting is done on backend side by applying the format() method from the NameFormatter class. It receives an entity and returns it as string which is formatted according to the defined rules. Mr. John S Doe Jr.
On the frontend side, the same formatting can be performed with the orolocale/js/formatter/name requirejs module which is located in Oro/Bundle/LocaleBundle/Resources/public/js/formatter/name.js. This module has a similar format() method which can be used to format a person object. Other entities may represent addresses that should be appropriately formatted when being rendered. The application provides a list of default address formats for several countries (see address_format.yml). Further, an address entity may have person fields and implement the FullNameInterface interface. In this case, the name will be rendered according to the country’s default locale and will be used instead of an appropriate placeholder. To support formatting, an address entity should implement the AddressInterface which defines methods to retrieve all required address parts (street, city, region name/code, postal code, country name/ISO2/ISO3 and organization). The backend formatter, AddressFormatter, provides a format() method which returns a string representation of an address that can include default newline separators (\n).